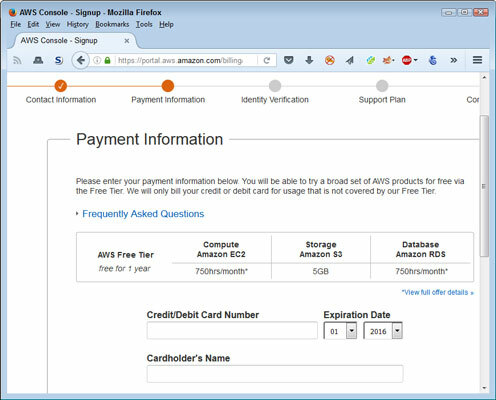 Navigate your browser to http://aws.amazon.com/. Click Create a Free Account. 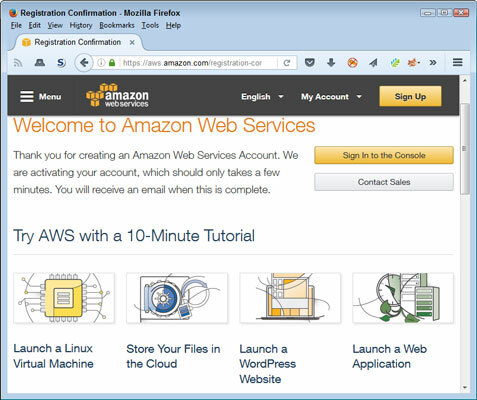 The main Amazon Web Services page appears. 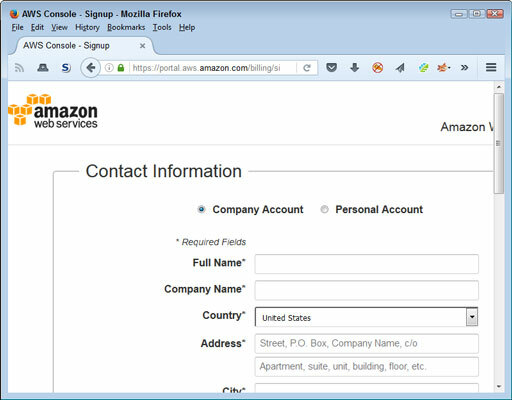 Unless you already signed into Amazon, you see a Sign In or Create an AWS Account dialog box like the one shown. 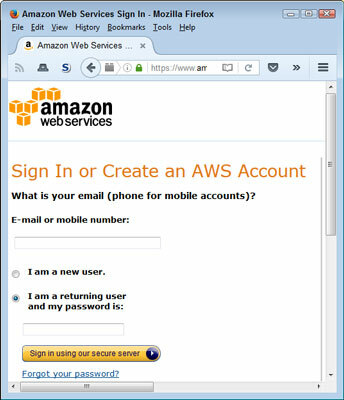 If you already have an Amazon account and want that account associated with AWS, you can sign in using your Amazon account. Otherwise, you need to create a new account. Sign into an account or create a new one as required. The Contact Information page appears. Notice that different pages exist for company and personal accounts. Supply the required contact information for the kind of account you want. Read and accept the customer agreement. Click Create Account and Continue when you complete the form. You see the Payment Information page shown here. Be aware that Amazon will bill you for any usage in excess of the free tier level. You can click View Full Offer Details if you have any questions about the level of support provided before you enter your credit or debit card information. Provide a credit or debit card to use as payment. Provide the required credit or debit card information, supply the address information needed, and then click Continue. You see the Identify Verification page shown. 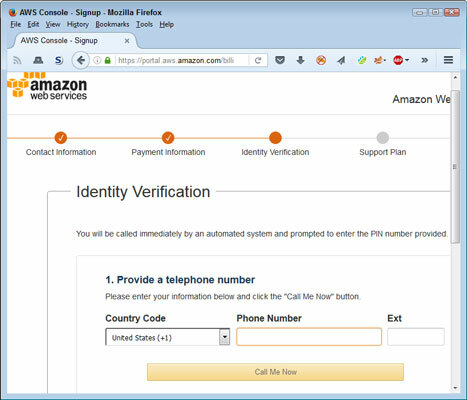 Amazon performs an automated call to verify your identity. You see a PIN provided onscreen. During the call, you say or type this PIN into your telephone keypad. The screen automatically changes as you perform each step of the identification process. Supply the information needed to verify your identity. Click Continue to Select Your Support Plan. Basic: Free support that Amazon offers as part of the free tier support. Amazon doesn’t offer any support through this option. You must instead rely on community support, which usually works fine for experimentation. Developer: Support that comes at $49/month at the time of this writing. A single developer (or other organizational representative) can contact the Support Center and expect a response within 12 to 24 hours. However, if you’re serious about developing an application and also anticipate using third-party products, you really need to consider the Business level. Business: Support that comes at $100/month at the time of this writing. A business user may contact the Support Center by phone and expect a one-hour response to urgent support problems as well as obtain help with third-party products. Enterprise: Support that comes at $15,000/month. This is the level of support provided for organizations that use AWS for mission-critical applications. The response time is only 15 minutes, and Amazon is willing to provide all sorts of technical help. Of course, the price is a tad on the steep side. 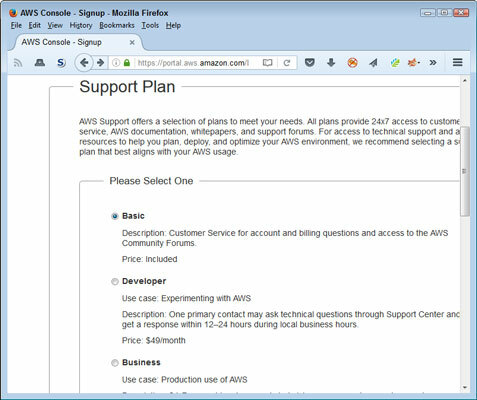 Choose a support plan and click Continue. Normally, you see a welcome page like the one shown. (However, you might also see a message saying that Amazon is setting up your account and will send you emails when your account is ready. Wait for the emails to arrive if you see these messages.) At this point, you can sign into the console and try a few tasks. The 10-minute tutorials are helpful in getting you started.